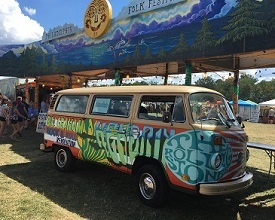 Why, you might ask, is a 1979 Volkswagen Microbus writing a blog post? It is quite a curious question. After all, when I was born, there was no such thing as a blog, let alone the internet, and the average computer was much larger than my sleek and colorful frame. But despite my advanced age, I’ve managed to keep up with the times, and therefore when asked by my compatriots at the National Museum of American Jewish History to write this post, I was happy to oblige. The second question you might ask is what does a VW Microbus have to do with the National Museum of American Jewish History on historic Independence Mall in Philadelphia? Well, as some of you know, the Museum is hosting the special exhibition Bill Graham and the Rock & Roll Revolution, which tells the story of a very special man and the major ’60s and ’70s acts he helped make famous, including the Grateful Dead, the Rolling Stones, Jimi Hendrix, Janis Joplin, Carlos Santana, and so many more! Buses like me were popular modes of transportation in the ’60s and ’70s, and would take people like you to concerts all over the country! Much like my passengers over the years, I’ve led a somewhat itinerant life. I was born in California, then made my way to Louisiana and Boston before finding my current home in Philadelphia. And I’ve got to tell you, life has been pretty good to me. I’ve had so many interesting owners and passengers over the years. Though I’ve been sworn to secrecy by previous owners and passengers, the folks at NMAJH said they would love for me to tell the story of my time here, so that’s exactly what I’m doing, and man, it feels good!!! The first thing that happened when I arrived to NMAJH is they saw that I was a bit worn down and they understood that I REALLY wanted a makeover. So Yael from the Museum asked the City of Philadelphia Mural Arts Program if they would help. Mural Arts said “groovy, man!” and hired artist Charles Barbin to create a way cool psychedelic design that he drew all over me. Then, members of the public were invited to come paint in the design (it was a “paint by numbers” type thing… that was really popular when I was a kid, so it made me feel super nostalgic). It was July 17—one of the hottest days of the summer—and the artist and NMAJH staffers and members of the public stuck it out until I was painted all over. I definitely felt LOOOVED! When they saw that my wheels had gotten a bit rusty, Jack from the Museum found a few different mechanics (yes, we did have to try a few, but we never gave up! ), Alyssa and Ilana from the Museum made sure I got to every one of them to get the TLC I needed, and Don made sure I was properly insured for my next adventure, which was a “trip” to WXPN’s XPonential Festival… It was a blast!! After that I unfortunately broke down again, but since it was my lifelong dream to visit the Folk Festival, my friends Julie, Liz, Ryan, and Anne made a video for Kickstarter and raised $10,000 to help fix my tired bones in time for me to realize my dream. I could not be more grateful! Since the exhibition about my man Bill and all the bands I love so much opened on September 16, I’ve been enjoying meeting a ton of people. I’ve been resting my newly rejuvenated wheels on the Museum’s Plaza. There is this new thing called Instagram, and I’ve been getting so much attention from people from all over the world who pose with me and then “post” on this Instagram “app” with the hashtag #GrahamRocks. Jenny from the Museum will occasionally “regram” some of the posts. You should come out and try it yourself; you might become Insta-famous!! I’ll be here until January 16... I hope to meet you in person before then! Great article Steely. We've taken the liberty of posting it to our German American Radio's Facebook page... along with may other VW postings. Huzzah for Volkfests!